US Vice President Joe Biden on Wednesday implicitly criticized Palestinian Authority leaders for not condemning attacks against Israelis, as an upsurge in terrorist attacks marred his visit to Israel. 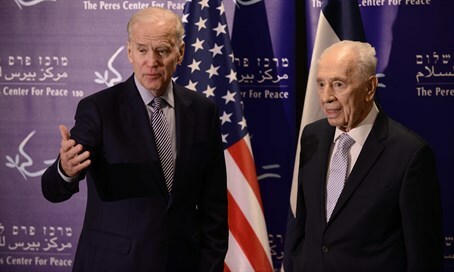 "The United States of America condemns these acts and condemns the failure to condemn these acts," Biden said after meeting Israeli Prime Minister Binyamin Netanyahu. "The kind of violence we saw yesterday, the failure to condemn it, the rhetoric that incites that violence, the retribution that it generates, has to stop." Six separate attacks have taken place shortly before or after Biden's arrival on Tuesday, including a stabbing spree on along the Tel Aviv/Jaffa waterfront by an Arab terrorist who killed an American tourist and wounded 12 people. That attack took place a mere few hundred meters from where Biden was attending an event with former Israeli President Shimon Peres. Biden said his wife and grandchildren had been having dinner on the beach not far from the site of the stabbings. "It just brings home that it happens and it can happen anywhere at any time," he said. Palestinian Authority leader Mahmoud Abbas has repeatedly praised the ongoing campaign of terror as, perversely, "peaceful resistance" or "popular resistance," and has not condemned any of the wave of knife, gun and car-ramming attacks that erupted in October. But apart from not condemning the violence, Palestinian Authority official TV even praised the Jaffa attack. The PA's rivals, Islamist terror group Hamas, also hailed the latest attacks. Biden will travel to the PA headquarters in Ramallah later Wednesday to meet Abbas.